The number one electric vehicle in the world may be a surprise to you; It’s an electric bike also known as an E-Bike. The electric bike has really been gaining popularity over the last number of years. More people are opting out of commuting with cars due to high gas prices, parking fees and frustrating traffic to deal with on a daily basis and are looking for a better option. With this added technology there are a few more things to stay on top of than a regular bike. In this post I will tell you what electric bike maintenance cost with a service chart below. Let's see what you can do to get the most out of your E-Bike with my Electric Bike Maintenance Guide. How long after buying a new bike should you bring it back for a Tune-Up? With an electric bike, you get the benefit of a motor to help you uphill and the traffic-free health benefits of riding a bike. The green movement and the push towards electric energy have motivated many manufacturers into developing new E-bikes with futuristic designs, longer battery life and the latest in technology. When you first get your new E-bike, after the first while you will want to bring it back to the bike shop for a basic Tune-Up. When should you bring it in for a tune-up? It depends on how much you ride. If you ride a lot you may go back in a month or if you don’t ride that often you may go back in a year. If you use your bike for daily commuting, it's probably a good idea to go back after around a month for a basic tune-up. Other signs that will indicate it's time for a tune-up." You may notice when shifting the gears don’t shift as smoothly. This often means the derailleur is out of adjustment and need a little tweaking. You may also find you have to press harder on the brakes to stop. Most likely the cables have stretched and the brakes need a little adjusting. Basic items to keep your bike in ship shape condition. Basic tool kit, wrenches, screwdrivers and pliers. Bike repair stand. This is for someone that is serious about repairing their own bike. Keep in mind E-Bike can weigh much more than a normal bike and a lightweight bike stand my not cut it. A good solid stand recommended is the Park Tool Team Issue Repair Stand. See Amazon pricing. Tip: when using a bike stand or transporting your bike. Always remove the battery from the bike. This can save you up to 8 or 9 lbs and make it easier to lift. It's a good idea when using smaller cheaper bike stands that may tip-over due to the heavyweight of an E-Bike with a battery. On-the-road kit is a great idea to have in a small kit attached to your bike in case of minor breakdowns. This is especially needed if you are going of roading in the backwoods. Be prepared to fix a flat or you may have to walk out for miles. I learned the hard way. There are a number of complete kits available from around $20 to $50 dollars. ​​See what Amazon has available. 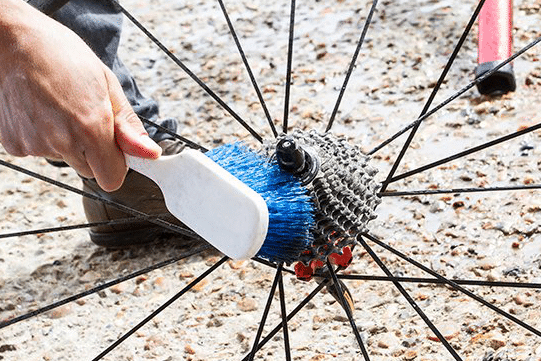 Before we start any tips regular cleaning of your bike is an important practice to help ensure things are working properly and it also gives you a good opportunity to inspect and become more familiar with your E-bike and how it should be working. This practice alone will greatly increase the life of your E-bike and reduce breakdowns that can ruin a day of riding. Learn more about how to clean your E-bike. Use a gentle degreaser soap for stubborn dirt, and to clean the chain, use a degreaser like diluted dish soap and apply with a soft brush or rag, then rinse. Remember always lubricate your chain after every wash. A good lubricant to use is Finish Line Dry Teflon Bicycle Chain Lube available at Amazon. It goes on wet and sets up with a dry 'wax-like' synthetic film that helps keep your chain clean by not absorbing excessive amounts grit, grime, or dust. Do not use a pressure washer to clean your E-bike ! E-bikes can handle a little water but high pressured water is not a good idea. I have summarized some maintenance tips for quick reference and added more information below for more in-depth explanations. 1. Regularly check and pump up your tires to the proper air pressure. Electric Bikes are heavier than most regular bikes and this extra weight puts added pressure on the tires. Low tire pressure can significantly reduce battery range. A good habit is to check and add air to your tires every third ride. This will make a big difference in getting the most out of your battery and the bike will have a better ride. 2. Make sure your battery is fully charged for each ride. Batteries like to be kept charged and should be fully charged before storing for the season. This is the common rule of thumb but keeping your battery slightly undercharged will extend the overall battery life. See section below for full details. 3. For Disc Brakes, do a monthly check on your brakes. Make sure the brake screws are tight. Particularly the rear wheel, it takes most of the weight and E-Bikes vibrate a lot more than a regular bike and screws have a tendency to loosen over time. 4. Brake Pads also need to be check regularly and replaced more often. On an E-Bike your brakes will wear down about twice as fast as a regular bike. Due to easy acceleration, E-Bikes drivers tend to use the brakes much more than drivers on a regular bike. Calipers with disc brakes also wear out faster and should be changed more often than a regular bike. They are a little trickier than brake pads but you can learn to replace them yourself or have a bike shop do it for you for around $25. Clean and lube your chain every couple of weeks depending on how much you ride. Use a penetrating oil to clean the chain and then follow up with a lubricant. 7. Keep derailleur clean and lubed. Include this step at the same time as when you are cleaning your chain. Many riders overlook this part of the drivetrain. A derailleur has many small working parts and excessive dirt and grime can affect the bike' s performance when shifting gears. Every few months check to make sure that your handlebars and stem are nice and tight. While you are at it check any mounted lights on the handlebar for tightness. Loose handlebars and a droopy light can be a real problem. Once a month makes sure that all cables are tight and connected. Due to vibration and cable stretching your brakes and shifter may not work as good as it should. So stay on top of it for best performance. 10. The cassette should be cleaned regularly. A little more involved removing and cleaning but an important maintenance requirement. Once clean make sure to thoroughly lube all parts with a Teflon based lube. Although tough, a cassette on a bike takes a lot of abuse and is an important part not to overlook. This is something you can do yourself or bring it down to a bike shop and they can do it for you. You might as well clean the chain if you are cleaning the cassette a degreaser soup and water mixture will work. There are also special chain cleaning systems from Amazon that also work great and can make the job easier. Tire pressure is very important on an electric bike. Low tire pressure can cause significantly more drag and cause the battery to lose power very quickly. The motor will have to work harder to produce the torque required to turn the tires. Example: A rider having problems with their battery not holding a charge and was only able to go down the road a few blocks before the battery was dead. It turned out the tire pressure was only 18 PSI this caused a lot of drag and killed the power. Read the side of the tire for proper air pressure for that specific tire. Every week or two check your tire pressure, at least once a month minimum. Improper tire pressure affects the handling of the bike, range of the battery and the performance of the bike. Fat tires are a little more complicated and have many variables. 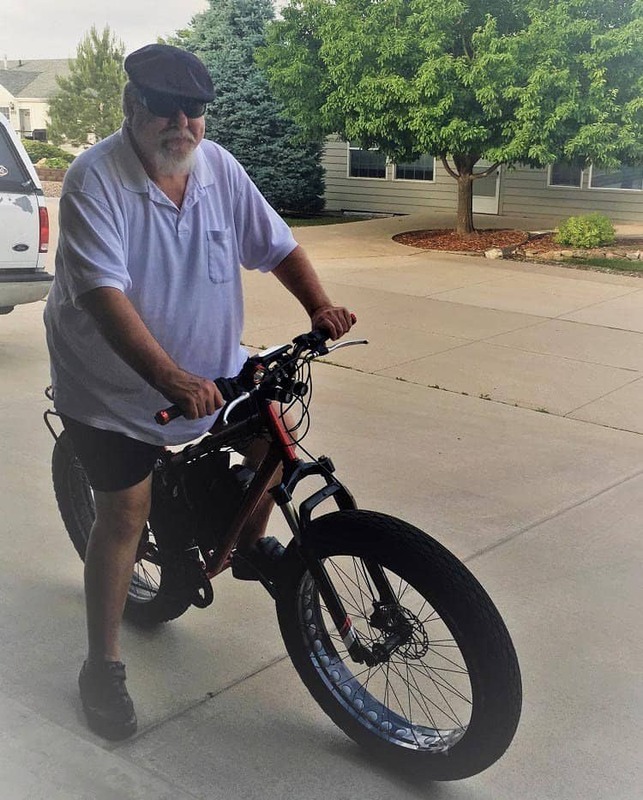 See my Fat Tire Pressure Guide for an E-bike to learn more about tire pressure. Low tire pressure can cut the range of the battery by as much as 50% very easily. A bike that should have a range of around 30 miles with low tire pressure will now be down to a little more than 15 miles. So stay on top of those tires. E-bikes are a bit more, or a lot more expensive than a normal bike so it’s a good idea to take care of it and take a few extra precautions to ensure it last a reasonable amount of time. It’s a good idea to bring it into an expert every 6 to 12 months for a full tune-up. If you ride only seasonally then at the end or beginning of the season is a good routine to get into. Brakes : Spin the wheels and make sure the brakes aren’t rubbing. Squeeze the levers—there should be at least 1 inch between the lever and handlebar when the brakes are fully engaged. Replace brake pads when there is less than ¼-inch of pad left. E-Bikes tend to go through brakes faster than conventional bikes. Chain and Cranks : Check to see that the chain is clean and lubed. Pull on the crank-arms and tighten the crank bolt if you find it loose. Quick : Check all quick release fasteners are all tightly closed. On a E-Bike check wires and connectors if they are loose damaged or broken. Check : Battery is fully charged and have one last look over to check for any loose or missing parts. This step is last but I think is very important because getting more familiar with your bike and how it should look and run properly will help you spot problems before they become a major issue. This will help ensure long happy rides without major breakdowns. For heavier people 280 to 300 lbs, they should bring their bike in more often. When riding, the spokes are actually stretching and loosening. If you don’t stay on top of this somewhere down the line you will start breaking spokes and a few broken spokes will shut you down. There have been a number of cases of spokes actually breaking. See Best fat tire e-bikes for 200 pounds and over. Every few years budget for a complete rebuild of hubs and headers. On a regular bike, this is not as much of a concern if it’s a little loose, you just have to pedal harder. But with an E-bike if things are not running smoothly this can greatly reduce the battery range and overall power. Electrical Problems on an E-Bike and what you can do about it. Electric bikes, unlike regular bikes, have an additional electrical system that can at times malfunction. Regular maintenance and battery charging will normally keep you riding trouble free, but occasionally electric issues will come up. If you have some electrical experience then you can do a little poking around but if you are inexperienced then it is probably best to bring it to your bike shop to have a look at it. Many electric bikes today have onboard diagnostics and most bike shops have special equipment and programs to help utilize this information and more easily find the problem. Before you go to the bike shop even if you are inexperienced there are still a number of things that you can check first. Check wire contacts to see if they are clean and corrosion free. See if a wire has come loose or broken. This problem can be caused by hitting a big bump and E-bike have a tendency to vibrate more than regular bikes. Start at one end and work your way through to the back. Think of it as a process of elimination. Make sure that your bike is powering up. Look at the controls on the handlebar and if the display and the LED lights are not lighting up then go down to the battery. Check to see if the battery has power. If it does not have LED indicator lights then you can check it with a voltmeter. If it’s a 48v battery and you measure 17 volts. There is your problem the battery is not charged. Charge up the battery and start again. If it’s a 48v battery and you measure 52 volts surface charge. Your battery is fully charged and you can eliminate battery power as the cause of your problem. Check connectors on battery and on the E-bike sometimes some dirt or the prong connector pins get bent and an improper connection is made. If it’s not plugged in properly the bike will not power up. You have power on your handlebars and but you're still not going. Often time it has to do with the brakes levers. You may have dropped your bike and bent the brake lever and the brake is now stuck slightly back. The brake inhibitors act as a cut off switch that cuts the power off when engaged. Makes sense you don’t want power when you have the brakes on. Look for any wires that may have been cut or broken. Follow the wires back to the connectors and see if they are properly fastened also make sure all contacts are clean and corrosion free. You can try resetting the bike by simply turning the E-bike off and back on. Basically, it performs a reboot just like your computer at home. This can sometimes get you going but be aware that there is most likely a problem with your E-bike and should be looked at more closely to diagnose the problem. If you're still having problems, take the time to watch the video above. 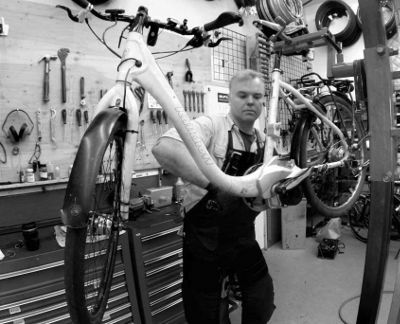 It can give you a number of things to look at before going to a pro bike shop. If you decide you are going to poke around and start taking things apart be aware that by doing so you most likely will invalidate your warranty. So be sure you know what you are doing or have someone that does before digging in. Be sure to work in an area where if parts are dropped they can be found. Working on the backyard lawn is a bad idea. Dropped parts will easily get lost in the grass. So as you can see there are a number of things you can do to keep your E-Bike rolling along in ship shape. Staying on top of things and familiarizing yourself with your E-bike by performing basic maintenance and cleaning will help you see problems arising before they become a real issue. It probably is a good idea to become more familiar and learn to fix your E-bike yourself, especially if you plan to go off-roading and because many areas do not have many E-Bike shops close by and the only alternative is to fix it yourself. I tried to cover a number of basic steps in this post to try to get you going. And again keep in mind if you don’t know what you are doing, err on the side of caution and get someone that does, as you can invalidate your warranty if you don’t watch it. If anyone has anything to add please comment below and share your knowledge.